Pokemon Go will jump forward another generation this holiday season, adding dozens of new pocket monsters to catch and collect. But before you start running around in the snow trying to capture Pokemon native to the Hoenn region, you can get a taste of what's coming starting this week. 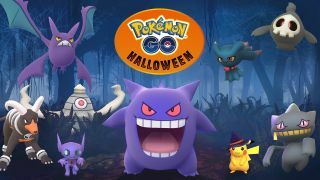 From October 20 to November 2, the Pokemon Go Halloween event will allow players to catch some of Gen 3's spookiest critters - including Sableye, Duskull, Dusclops, Shuppet, and Banette. There's also, of course, Pikachu wearing a new type of hat. The only question is what will the designated nickname be? Pi-witch-u? Maybe just Witch-chu? Gen 3 Ghost types won't be the only Pokemon to catch during the event, nor are they its only reward. Pokemon across all generations befitting the spooky nature of Halloween such as Gastly, Cubone, and Drowzee will appear more often, trainers will earn twice as much Candy from catching, hatching, and transferring Pokemon, and your assigned Buddy will find Candy twice as fast. It's pretty fitting for the holiday, don't you think? There will also be a new selection of bundles in the store, containing items like Raid Passes and Super Incubators. As for the remaining 120+ Gen 3 Pokemon, Niantic writes that "Pokemon first seen in the Pokemon Ruby and Pokemon Sapphire video games will gradually arrive starting as early as December". There's no word on just how gradually the company intends to roll these Pokemon out, but we've reached out for comment just in case. Either way, enjoy your Candy, trainers.